Mog The Forgetful Cat is the story that introduced Mog to young readers at the beginning of the 1970s. You’ll see from the illustrations that this is a book of its time, with 1970s fashion and a traditional nuclear family set-up, including a population that, compared to modern day London, is overwhelmingly white. 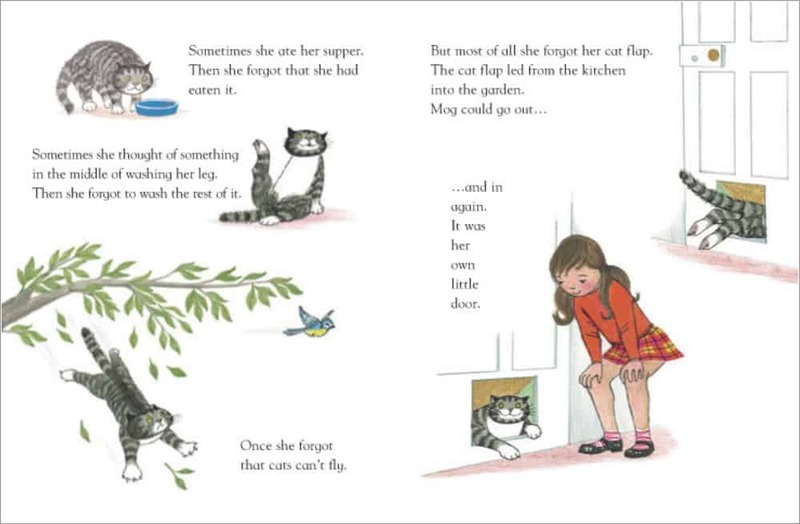 If there is a spectrum of personification when it comes to animals in picturebooks, Mog is still very much cat rather than person, but Judith Kerr manages to convey the idea that she indeed knows exactly what goes on in cat’s world — what cats worry about, what they dream about and what their main concerns must be. This story is mostly a character sketch of a mischievous cat called Mog. Mog’s mischievousness is reframed as forgetfulness. She doesn’t ‘steal’ an egg at breakfast time; she ‘forgets’ she only has eggs as treats. This lends a gentleness to the character, and allows young readers to empathise. The plot of the story takes off after Mog is shut outside for being a nuisance. It just so happens that a burglar arrives that night. Mog frightens the burglar, who makes a noise by dropping something, thus awakening the family who are able to call the police to apprehend the baddie. Mog is now a hero. The burglar in this story is an archetypical comic character dressed in a raccoon mask and striped prison uniform. He is smaller in stature than the policeman who comes to apprehend him. Rather than being locked up in handcuffs, the burglar even holds the policeman’s cup of tea while the policeman makes notes on a pad. This comic representation of intruders makes this story a perfectly safe going-to-bed book. Though this book is not an early reader, the ‘voice’ of Mog is depicted in short, simple and repetitive sentences to suggest a naivety to a creature whose thoughts are probably less complex than those of a human. In effect, this turns the Mog series into books appropriate for emergent readers. Judith Kerr seems to use a mixture of black line filled with vibrant ink washes, but also makes use of either crayon or coloured pencil to achieve more muted backgrounds and dream sequences. The lines of the coloured pencil give these pictures a naivety — they seem to be done with the same materials a child would own. The faces of the characters are representational rather than serving to make them unique, with a single line for a nose, black dots for eyes and a series of lines and circles for mouths. This way of drawing characters allows a wider range of readers to see themselves in this family, and also makes Mog, who has a similarly simplistic face, to really look like one of the family. Mog’s many emotions are depicted by changing the shape of her eyes. One convention of picturebooks — utilised often throughout Judith Kerr’s books — is the convention of placing multiple scenes on a single page where there is much action, versus a single scene covering an entire page or double spread when the pacing of the story takes on a more contemplative mood. Below, many things happen in quick succession. There is a little ground colour to suggest ‘grounded’ characters (rather than floating through space), but other than that, the background is white. This is the first of the Mog series of books, of which there are 17. Published in 1970, the next in the series didn’t come out for another six years. (Mog’s Christmas.) The rest of the series came out more regularly all through the 1980s and 1990s. The last of the series (Goodbye, Mog) came out in 2002. 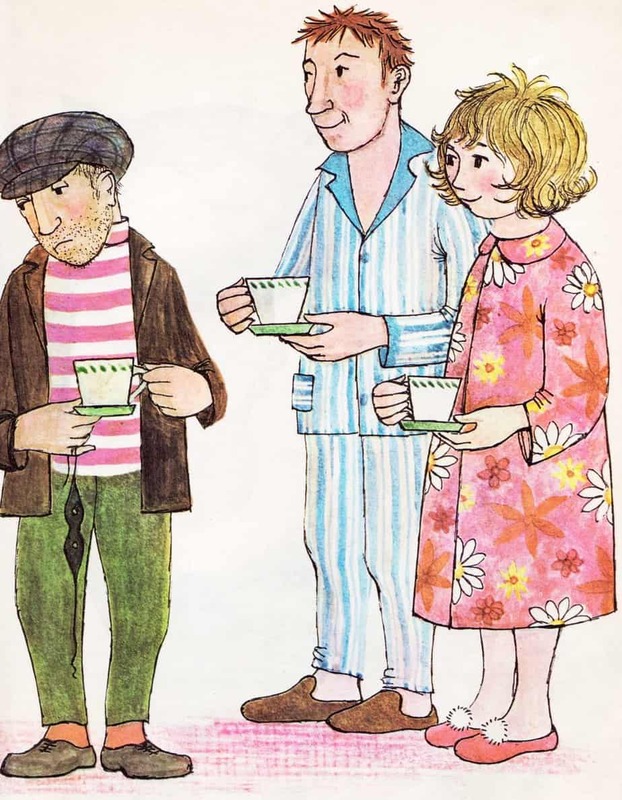 Judith Kerr based the house/setting/family characters very much upon her own family. In 2012, HarperCollins released Mog The Forgetful Cat as a universal app on the iTunes store. But they seem to have stopped adapting the Mog series as book apps, and perhaps released this one as a marketing experiment. The app allows readers to record their own narration. 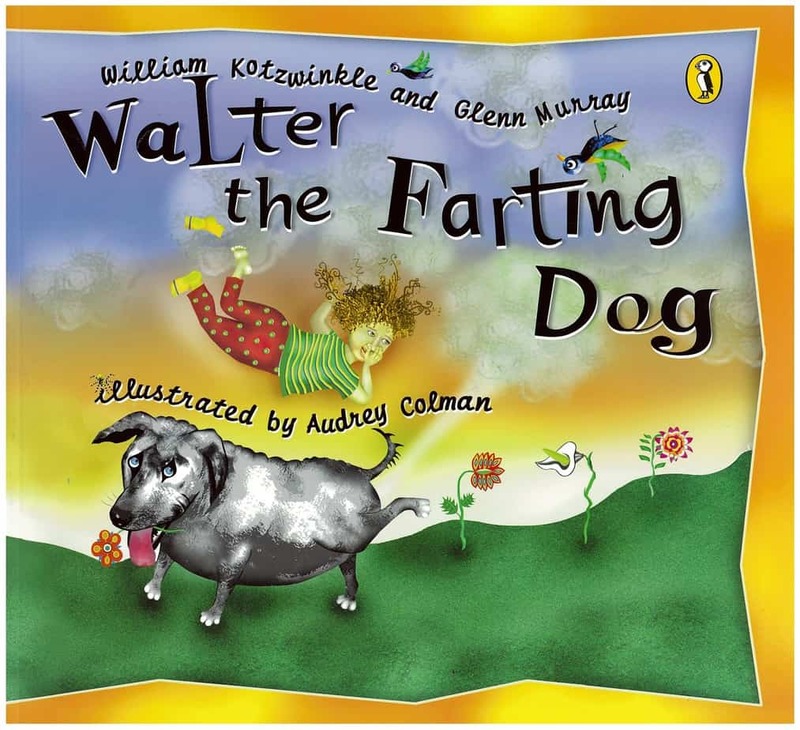 Another story in which a family pet is rejected, then saves the day by ‘catching’ a robber is Walter The Farting Dog. This time, the dog gases the burglars out with his rancid flatulence. This is an ‘animal saves the day’ book. Most of these books are about dogs, though obviously some are about other household pets and farm animals. Can you think of a similar sort of story but one in which a human is helped out by a lesser-known animal? To what extent will this animal need to be anthropomorphised?